Superior Traction and Stability - Designed for tackling more challenging terrain, in the most challenging winter conditions, the Hike XP provides superior traction and stability in all cold-weather environments. 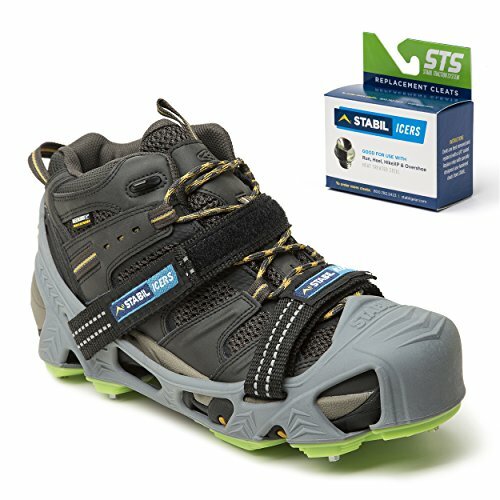 Full Foot Slip Protection - Heel and forefoot cleats provide full foot slip protection and maintain traction throughout your natural stride while walking. Replaceable cleats and proprietary tread are designed for optimum stability and traction from frozen streams to un-groomed trails. SureFitTM Binding System - The SureFitTM Binding System and contoured insole provide a secure fit and all-around better performance. Proprietary TPE Compound - Lightweight, proprietary Thermo Plastic Elastomer exhibits superior strength and durability, and performs in the coldest winter conditions. It is easy to take on/off, and fits securely to shoes and boots. Heel and forefoot cleats provide full foot slip protection, while cleat placement and proprietary tread deliver optimum stability and traction in all cold-weather environments. SureFitTM binding system and contoured insole provide a secure fit and all-around better performance. Lightweight Thermo Plastic Elastomer provides maximum strength and durability in the most bitter winter temps. Replaceable cleats yield affordable use season after season (25 Replacement Cleats included).